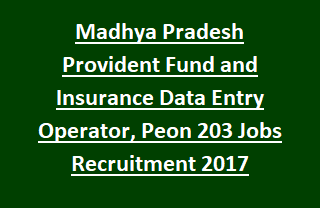 MP Provident Fund and Insurance Recruitment DEO, Peon Govt Jobs 2017: Directorate of Pension Provident Fund & Insurance, Madhya Pradesh has released employment notification for the recruitment of eligible/ interested candidates for filling 203 Data Entry Operator and Peon posts. Current recruitment notification has released on 8th December-2017. Candidates interested for this MP Provident Fund and Insurance Recruitment have to visit the official website www.pension.mp.gov.in and apply for Peon and DEO jobs. Last date for submission of application forms is 23rd December-2017. There are total 203 vacancies available in this Provident Fund and Insurance MP Recruitment notification 2017. Age of the candidate applying for DEO, Peon vacancies is 18 years to 40 years. Postal address details, Qualifications, application procedure, pay scale details of MP Provident Fund and Insurance Recruitment of 203 Data Entry operator, Peon govt Jobs, please go through the below given information. Last date for submission of application forms: 23-December-2017 before 05.00 PM. Total vacancies available in MP Pension Provident Fund and Insurance Recruitment are 203 posts. 1. Data Entry Operator: 53 posts (UR: 20, SC: 09, ST: 22, OBC: 02). 2. Peon: 150 posts (UR: 75, SC: 24, ST: 30, OBC: 21). Data Entry Operator: 10+2 qualification and Certificate Course in Computer Operator/ applications. Peon: 8th pass from recognized Board. For more qualification details see the Notification. Candidate should have minimum age of 18 years and maximum age limit of 40 years for both Peon and DEO vacancies. Relaxations applicable as per MP Govt instructions. MP Pension Provident Fund & Insurance Recruitment 203 DEO, Peon Jobs Selection is based on applicant performance in Written Exam/ Typing Test. Interested/ eligible candidates may apply for DEO, Peon jobs using the official website www.pension.mp.gov.in. Detailed notification has released on 8th December-2017. Last date to reach application form for Peon, DEO jobs is 23-December-2017 before 05.00 PM. Jail Road Arera Hills,Bhopal (M.P.) Pin-462011.